Nestled in the majestic Black Hills, Ellsworth Air Force Base, S.D., is located 10 miles east of Rapid City and just outside of Box Elder. 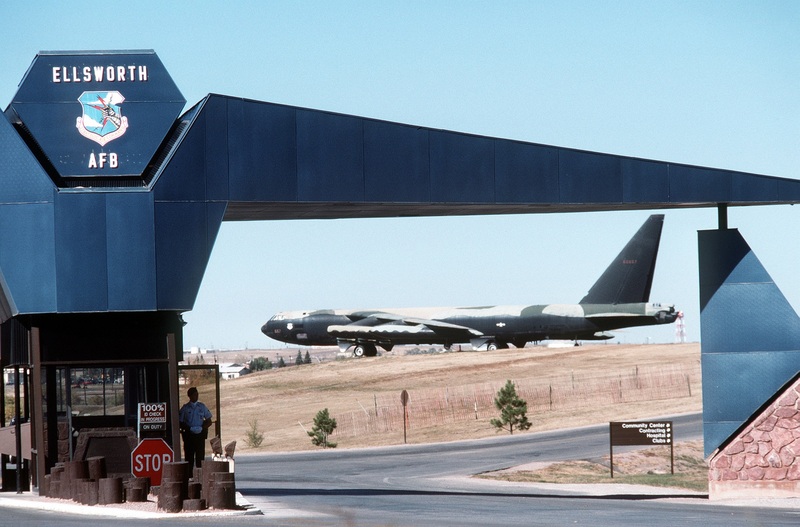 The base is home to the 28th Bomb Wing and is one of only two B-1B bases in the world. Ellsworth is surrounded by numerous scenic sights. From the picturesque Badlands to the east, to the Black Hills in the west, to the grazing buffalo and pristine lakes of Custer State Park, this is a region of great natural beauty. Legendary sites including Mount Rushmore, Crazy Horse Memorial, Fort Meade, historic Deadwood and Devil's Tower are a short distance beyond the base's main gate. The area has a rich history that includes Crazy Horse, Sitting Bull, General George Custer, Wild Bill Hickok, Calamity Jane and Jack "Crooked Nose" McCall to name but a few. Western South Dakota and the Black Hills offer a myriad of activities, especially for those who enjoy nature and the outdoors. Opportunities for fishing, boating, snow and water skiing, hunting, hiking and camping await those who appreciate being outdoors. Whatever the season, the Ellsworth and the Black Hills can be a wonderful place to work and live. Ellsworth was initially opened as the Rapid City Army Air Base in September 1942, and was a training base for the B-17 "Flying Fortress." In June 1953, the base was renamed Ellsworth Air Force Base in honor of Brig. Gen. Richard E. Ellsworth, commander of the 28th Strategic Reconnaissance Wing, who was killed in March 1953, when his RB-36 crashed in Newfoundland. President Dwight D. Eisenhower dedicated the base in honor of General Ellsworth. The 28th Bomb Wing is assigned to 12th Air Force under Air Combat Command. The 28th Bomb Wing guarantees expeditionary combat power - anywhere on the globe. Every world class Airman sets the standard for sustaining our people, generating our aircraft, maintaining our equipment, defending our base, and operating our network - with an unwavering focus on expeditionary combat power. The 28th Bomb Wing is home to 27 B-1 Lancers. In 2012, the base began flying MQ-9 Reaper missions. Ellsworth AFB serves approximately 3,100 military members, 3,664 family members, and 688 civilians. rom 0700-1600. This transportation is available for official use only. If you have any questions, please contact the 28th Logistics Readiness Squadron 605-385-2910. A valuable resource to have before making your move to Ellsworth is your sponsor. Your sponsor should have been appointed by your new unit upon receipt of notification of your assignment. The sponsor is responsible for making contact with you within 48 hours after appointment. After contacting you and inquiring about any specific needs or questions that you may have, he or she will send you a package with information that you requested, along with other items about the base and local community. After arriving at Ellsworth, your sponsor will greet you and show you around the base and local area. Spouses may request sponsors as well. Should you ever need additional assistance and you cannot reach your sponsor, contact Relocation Services within the Airman and Family Readiness Center at DSN 312-675-4663 or 605-385-4663 for additional assistance. The Postal Service Center needs pertinent information from you to handle your General Delivery. Prior to having your mail forwarded to Ellsworth, please call the Ellsworth Postal Service Center (PSC) at DSN 675-6229 or 605-385-6229. If you do not notify the PSC ahead of time, your mail will be held for only 15 days. After 15 days, it is returned to the sender. Until you get a permanent address, your mail may be forwarded to (Rank/Full Name), 2650 Spaatz Drive, Unit 5000, Ellsworth AFB, SD 57706. Ellsworth is located 12 miles east of Rapid City on Interstate 90. There are two exits that service Ellsworth -- Exit 63 and Exit 67B. New arrivals should use Exit 67B. The Visitor Center or Main Gate personnel will direct you to the Pine Tree Inn, where you can contact your new unit and arrange temporary accommodations. Travel on route 44 west to Interstate bypass (enter with a left turn). Exit right onto Interstate 90 east. Travel east on Interstate 90 until you reach either Exit 63 or 67B. No listings found for Ellsworth Air Force Base.